Margo ThunderBird is of the Shinnecock Nation of Long Island, New York. She is a singer, songwriter, storyteller, and lecturer with over forty years of experience. 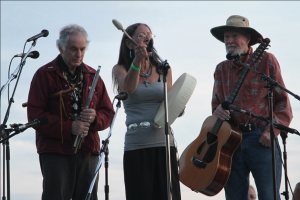 Margo and her band, The Thunderin’ Herd sing and perform Tradition, Folk, Rock and World music. She has created a unique program for people of all ages that speak of life from a native woman’s perspective. Their newly released EP, ‘Honoring’, is a special edition CD commemorating The Liberation at Wounded Knee, 1973. The songs speak of the struggle of Native Indigenous peoples. The song Fighting Woman Spirit is significant because it honors the spirit of Native Women who have striven to keep alive the culture of their people. In conjunction with her music, Margo ThunderBird established, in 1994, Bounty Farms at ThunderBird Acres in upstate New York. Bounty Farms is both a working organic farm and the home to The Algonquin Language Camp.